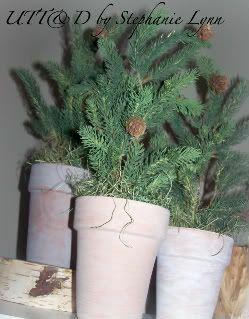 I’ve seen these in many catalogs this season and thought they would go along with my nature inspired holiday decor. 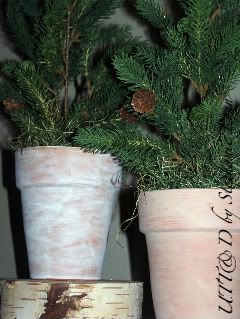 They are very easy and inexpensive to put together and another way to bring the outdoors in ~ in a faux kind of way! 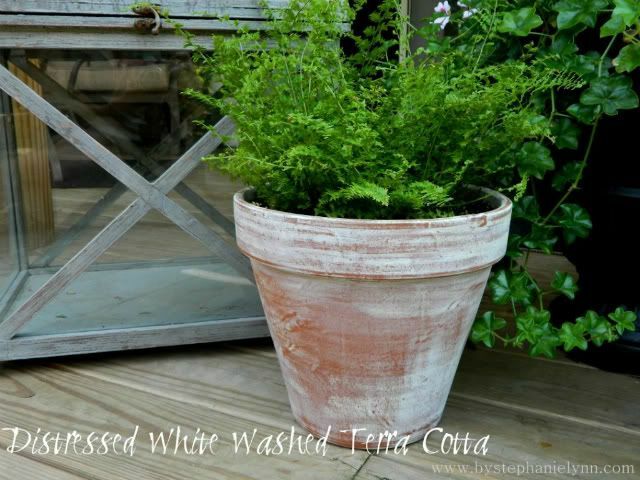 I started by white washing several terra cotta pots I had stored away. 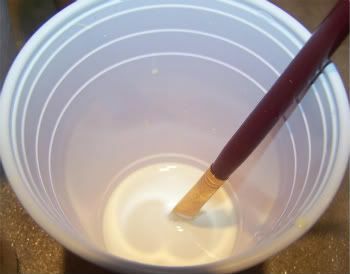 To do this I simply added a few drops of acrylic paint to a cup of water. The more paint you add the more opaque your ‘wash’ will be. 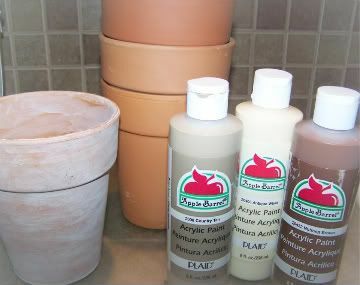 Brush the mixture onto your pots and let dry. 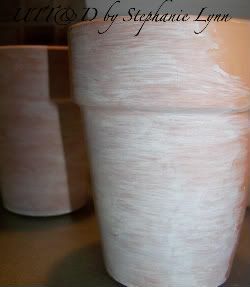 I played around with a few different colors since I wanted each pot to have a different look. I used a combination of Apple brand Country Tan, Antique White, and Nutmeg Brown. 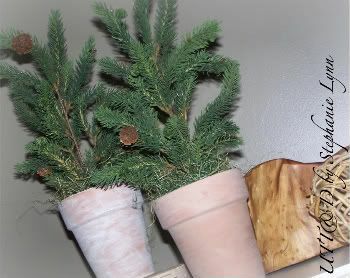 I did purchase a few new pine stems since I was looking for a more realistic looking ‘cutting’. I found some on sale at Michaels for $1.20 a stem so it was not that bad! I stuck a piece of cut floral foam in each pot, cut the stem to size and filled with green spanish moss. Such an easy way to add a little bit of green to your decor! Thanks. I have been so frustrated. Google has done this since DAY 1. I will be sailing along and for no reason my visitor count would just plummet, now I know to start checking because it has happened so many times but at first I wouldn’t know till people started contacting me. I had a HUGE give-a-way that started OCT 1–over 40 cool gifts from vendors-harfly had anyone registering for the give-a-way. Then about day 5 people started contacting me telling me they noticed their post didn’t show up from previous days so they checked each day and none of their posts were there–ot was a night mare. I ended up adding on days to the give-a-way, felt terrible because I had no way of contacting people who had registered to let them know…gave away a free month of advertising to my advertisers. I love the nature inspired decor. These fit right in and look festive as well. Love, love, love the way these turned out!